Yellow and red leaves. Carved pumpkins. Halloween decorations. Pumpkin chests. The rattle of skeletal bones. Wait, what? Halloween has arrived in Albion. From October 25 until November 15, it will change the world. Halloween decorations have been put up in the cities to put you in the right mood before you head out to explore all the new things and earn special rewards, only available throughout the event. Why, yes, of course! What would an event be without rewards? You can trade in your collected Pumpkin Pips at the Vanity Merchant for great, time-limited seasonal rewards. And the ultimate reward, the Horse Macabre. While exploring the lands of Albion, you will find Pumpkin Pips - tokens only available during our Halloween. You can gather them from our Random Camps, chests, Locked Pumpkins (that randomly appear in place of resources), the Arena, or in Expeditions. These Pips can be exchanged for neat rewards - or traded with other players. Arena Masters – Compete in a seasonal 5v5 tournament, streamed live AlbionTV - claim your place as the best team! The Headless Descent – Investigate a mysterious maze in the Underway, compete against others, reach the end – earn your reward! Arena All-In – Challenge other teams for a winner-takes-all match live on the AlbionTV stream. Become famous - and rich! Head on over to our event page to read more. 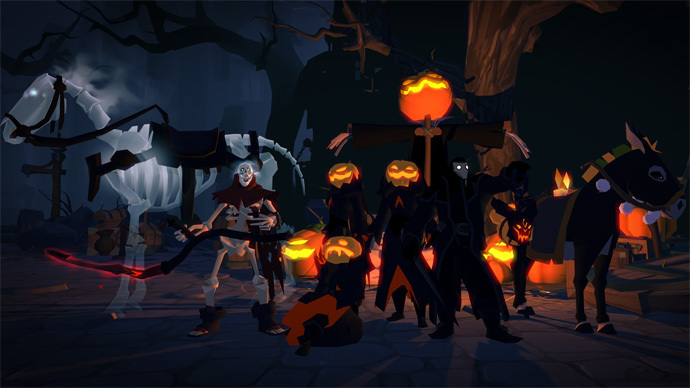 Let us know about your thoughts on Halloween on the forums. (We wouldn’t mind pumpkin-related recipes either).